Every year, the Academy nominates five films for Best Animated Short Subject, and every year the majority of people tuning in to the broadcast mentally tune out when it comes time to announce the winner. Not that I can blame them, really; with very few exceptions (such as the shorts that precede each new Pixar release), these movies aren’t readily available to the public, making it a chore (and, sometimes, an impossibility) to track them down. But thanks to a handful of DVD releases, including Image Entertainment’s 2010 offering Animation Express, we can now watch some of these fine shorts, and one of the best this particular collection has to offer is 2007’s Madame Tutli-Putli. The work of filmmakers Chris Lavis and Maciek Szczerbowski, this 17-minute stop-motion short (produced with funds provided by the National Film Board of Canada) concerns a shy young woman, Madame Tutli-Putli, who, with the majority of her worldly possession in tow, boards a train (the destination of which is never revealed). Crowded into a cabin with her belongings as well as a few other passengers, Madame Tutli-Putli passes the time by reading a book. Later that night, though, when the train comes to an unscheduled stop, Madame Tutli-Putli (now all alone) must deal with a frightening situation, one that causes her to leave the safety of her cabin and search for help. With its setting (a train) and period clothing, Madame Tutli-Putli reminded me of Agatha Christie’s Murder on the Orient Express, yet while the movie is somewhat mysterious (especially towards the end), the focus is placed more on the inner workings of its lead character’s mind, leaving us to wonder if what she’s experiencing is real or imaginary. There are moments of humor, like the scene where two men are playing chess (the train occasionally rocks and sways, causing the pieces to move around the board on their own, often landing in different spaces than the ones they occupied a second earlier. Instead of fixing the problem, the two play the pieces wherever they land), as well as an uncomfortable sequence in which a male passenger sitting across from Madame Tutli-Putli makes an inappropriately obscene pass at her. But the real strength of Madame Tutli-Putli isn’t its story; it’s the incredible animation. To accent the seamless stop-motion, Lavis and Szczerbowski superimposed images of actual human eyes over top of the puppet’s faces, bringing unexpected depth to the characters while making them appear both real and artificial at the same time. 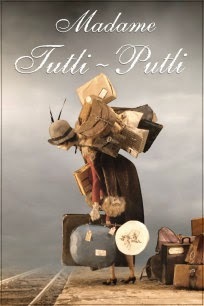 Despite its gorgeous animation and engaging (if somewhat elusive) story, Madame Tutli-Putli did not win the 2007 Oscar for Best Animated Short (the award went to the Polish production of Peter and the Wolf, a 33-minute adaptation of the classic children’s story featuring the music of Sergei Prokofiev). But even though it lost the Oscar, Madame Tutli-Putli is an extraordinary movie, and has me wondering how many other exceptional animated shorts are out there for the taking. As I mentioned in the comments of your "Jason and the Argonauts" review I'm a big fan of stop-motion animation so it was wonderful to find out about a film like this. Just judging by the trailer it looks to have been beautifully made and I'll definitely be adding it to my to-watch list. Also, I'm curious if you're familiar with the work of stop-motion animator Ladislas Starevich? He did some amazing and whimsical work in the early 1900's and if you have an interest in the history of stop-motion I'd definitely recommend checking him out. His film "The Mascot" is one of my favourites. Thanks again for a great review Doc!